If you are looking for a meal…look no further than the Dakotah Buffet. The Dakotah Buffet has an excellent selection of entrees to choose from. Complete with soup, salad bar, main dishes and deserts there is sure to be something to satisfy everyone’s palate. IT’S EASY to see why our Dakotah Buffet is so famous. In addition to nightly specials, the Dakotah Buffet serves up a superb selection of your favorite foods. You’ll want to try them all. Please present photo ID with all transactions and Player’s Club promotions/coupons. 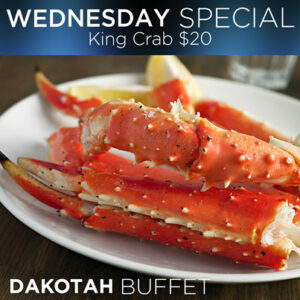 This May enjoy the great specials in Dakotah Buffet! Earn 1 point with your Players Card and your lunch is $3!! Present your Players Club Card to receive this discount! Prices for children 12 and under are based on the child’s age.